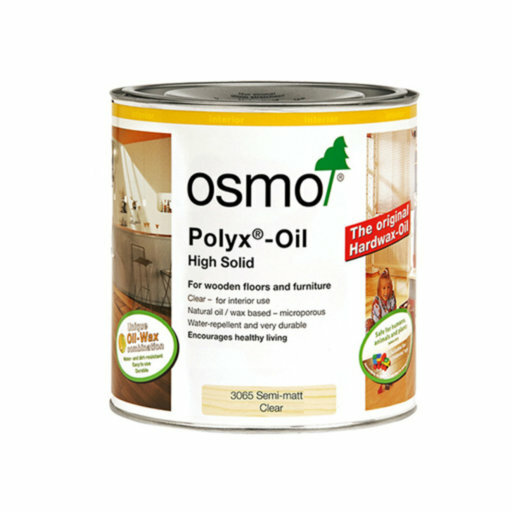 The Osmo Polyx-Oil is a professional, clear, matt finish oil for all wooden floors (solid wood floors, laminated flooring, oriented strand-board etc.). Can be used on cork floors, terracotta and other unglazed tiles. It is also well suited for the treatment of furniture surfaces (i.e. table tops). The Osmo Polyx-Oil surface is extremely tough and hard-wearing. It is water-repellent and dirt-resistant. The finish is resistant against wine, beer, cola, coffee, tea, fruit juices, milk and water etc. Dirt can easily be removed without trace. Renovating, even partially, is easy. Just clean and re-treat worn areas: No sanding, no repair marks, no removal of previous Polyx-Oil finish. The wear resistance of floors treated with Osmo Polyx-Oil even exceeds that of conventional parquet seals and varnishes. Osmo Polyx-Oil is based on natural vegetable oils and waxes. It is micro-porous and does not crack, flake, peel or blister. Therefore it is an ideal treatment even in rooms with high humidity. Osmo Polyx-Oil is very easy to apply: Only two thin coats no primer!). The short drying time allows both coats within one day. It is of a creamy consistence (thixotropic). The satin-matt sheen can be intensified by slight polishing. Grain and texture of the wood are accentuated. A wooden floor which has been treated with Osmo Polyx-Oil will become more beautiful and valuable with age. Product based on natural oil and wax Osmo Polyx®-Oil is based on natural vegetable oils and waxes. Natural oils and waxes penetrate deeply into the wood, keeping it elastic and healthy, and preventing it from getting dry and brittle. The wood is allowed to breathe. Moisture can evaporate. Shrinking and swelling are reduced. Osmo Polyx®-Oil does not contain biocides nor preservatives. It is safe for man, animal and plant when dry and complies with German DIN 53160 (fast to perspiration and saliva) and EURO-NORM EN 71 (suitable for children’s toys). Did you know? You can order small 50 ml sample pot of Osmo Polyx-Oil Hardwax-Oil, Matt Finish, to try the product before you buy. This product is available in different sheens and sizes. Very easy to apply, even in a DIY capacity and given you have read carefully the instructions. You get nice vibrant colours on the wood and very durable surface. Could be used both for furniture and flooring.